Nick Stenson steps in to give Damon’s hair a quick spritz. 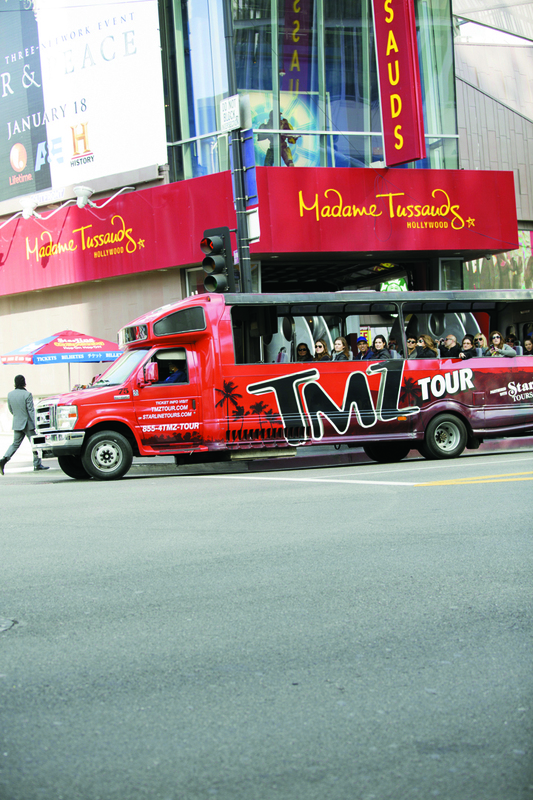 The TMZ tour bus makes its way down Hollywood Boulevard. The Walk of Fame runs 1.3 miles east to west on Hollywood Boulevard. We asked Matrix Artistic Director Nick Stenson to help us bring our cover story to life this month, and he more than delivered the goods. The idea was to create a collection of lived-in looks with an edgy, editorial feel—chic but not purposeful. To that end, we took four young models to the historic Hollywood Roosevelt Hotel on Hollywood Boulevard. Built in 1927 and financed by a group including popular actors Douglas Fairbanks and Mary Pickford, the hotel was named after President Teddy Roosevelt. Today, after a major renovation, it’s become a magnet for young Hollywood thanks to the trendy nightclub Teddy’s in the main lobby, which made it the perfect spot for us to set up shop. Matrix Style Link and Total Results gave Nick the tools he needed to let our kids take a walk on the wild side or look polished enough for the red carpet. Choosing Damon for our cover was a no-brainer. With his blue eyes and shock of platinum blonde hair, he reminded us a little of Lucky Blue Smith, who is just 18 but already has the second highest number of social media followers of all male models in the business. Teen Vogue named him the “Model of the Moment” in 2015. What we didn’t know when we cast him for this shoot is that Damon comes from a family of hairdressers, who have been reading American Salon for as long as he can remember. We literally stopped traffic on Hollywood Boulevard while we were shooting our models in evening attire on the Walk of Fame. The TMZ tour bus actually slowed to a crawl so tourists inside could snap photos as it passed by.